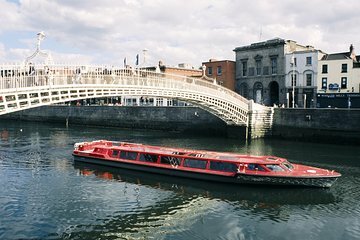 Fahren Sie mit dieser landschaftlich reizvollen Kreuzfahrt den Fluss Liffey im Herzen von Dublin hinab. Erfahren Sie in einem lokalen Führer mehr über die irische Geschichte und behandeln Sie dabei die Themen der Wikinger bis hin zur jüngsten politischen Geschichte. Sehen Sie die Wahrzeichen der Stadt, einschließlich der Ha'penny Bridge und des Custom House, aus einer neuen Perspektive und sehen Sie sich die jüngste Neuentwicklung von Dublins Docklands-Viertel an. We had a great tour, cruising the Liffey! We had a quite lovely tour guide, who decribed all of the buildings around the river. He explained all those buildings with a great humour! We would definetly recommend this tour! Interessant und kompetent, aber viel zu teuer für die Zeit und Leistungen. Charming! It was a truly lovely boat ride and trip with two excellent, informative guides. It was very warm outside and the boat was so hot. Tour was not very informative and didnt go very far. Tour on river was interesting. Cruise on the Liffey river in Dublin in a beautiful boat. View of some buildings and bridges until the last bridge that is before Dublin harbour. View on the new docks and modern buildings. The commentary in English is clear and explains some facts about the history of Dublin. Although it is impossible to see Dublin directly because the deck is closed, the view through the windows is good. It's a good experience.